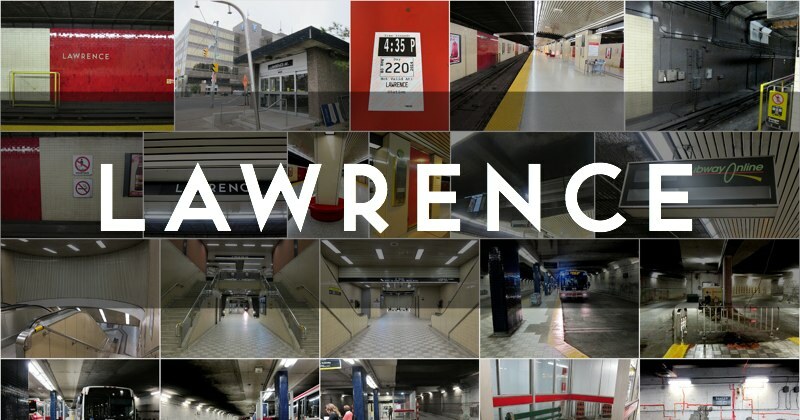 I have an inordinate fondness for Lawrence station. My first job out of university was with an intense software startup at 3080 Yonge, the office building on the north-west corner of Yonge and Lawrence, above the station. Over my years there, I grew to love the surrounding neighbourhood; the adjacent Locke library remains my ‘home’ library branch to this day, even though I reside downtown. Lawrence opened in 1973 and offered the system’s first underground bus terminal (which is regrettably now somewhat showing its age). The lengthy, multi-level complex has eight escalators and numerous staircases to match. At the time it was the largest, deepest, most expensive station ever built by the TTC. The station formed part of an important extension of the Yonge line from its former terminus Eglinton, out to York Mills. When I think of all the times I hustled through this station late for morning meetings, or trudged down the escalator after another exhausting day upstairs, it fills my heart with nostalgia. How many times did I wait on this central-island platform? Lawrence Avenue (and by extension, the station) is named for the family from Yorkshire that came to settle in the area in 1829. Peter Lawrence originally bought the farmland; Jacob Lawrence ran a tannery on the southwest corner of Yonge and Lawrence. Wilfred Dinnick’s development company Dovercourt Land purchased the Lawrence farm and many adjoining parcels in 1907; he named the newly created suburb Lawrence Park.